And then it struck him that all the reviews he was shown were almost identical in content . . . they had been authorized! And in the end even Western newspapers used the same set phrases, the same interpretation, often enough the same sentences. Edward Snowden masks. Do you remember these? It was the summer of 2013, and I was in Germany. While Snowden fled the United States to Hong Kong and then Russia, students in Berlin demonstrated, chanted, and donned Snowden’s face. Later I would catalog this detail alongside other things I observed in Berlin: a distaste for Facebook (invades privacy); a distaste for Google Earth (same); and, at the Freie Universität, an advanced-level seminar on James Bond. It all points to one important fact: Germans care about spies and surveillance. 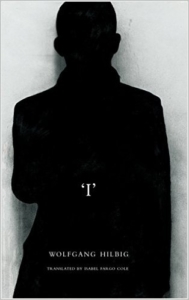 Wolfgang Hilbig’s ‘I’ was first published in Germany in 1993. Four years had passed since reunification, and memories of the East German surveillance state were still fresh. Born and raised near Leipzig — in the East — Hilbig worked for years as a stoker, and he wrote poems in the boiler room. He struggled to publish in East Germany, where his work was considered too dark and obscure, but his writing found a better reception in the West: in 1979 the prestigious S. Fischer Verlag published Hilbig’s first poetry collection, and more collections and novels soon followed. While his work flourished in the West, Hilbig remained in the East. In 1985, he was permitted to travel between the two German states; after reunification, he moved to Berlin. That Hilbig never truly defected from East Germany and that he remained skeptical of consumer society in the West — in fact loathed it — set him apart from more mainstream peers. His combativeness enlivens and animates ‘I’. The publication of ‘I’ by Seagull Books marks the first appearance of Hilbig’s writing in English, and Isabel Fargo Cole’s finely-tuned and lyrical translation makes for a smooth introduction. Set in ‘80s-era East Germany, the novel charts the journey of an aspiring writer, M.W., who lives in East Berlin. He hammers out poems and stories on a typewriter. He visits cafes. He reads: Thomas Mann, Samuel Beckett. M.W. is also a spy. He works for the Stasi as an “informal collaborator” (Inoffizielle Mitarbeiter, or IM), and when he’s not reading or writing or drinking, M.W. is peering into windows, eavesdropping, sneaking through the sewers stretching under Berlin, and writing up what he sees for his boss, Feurbach. The mission? To infiltrate the literary scene. In Hilbig’s universe, the Stasi care about literature. Feurbach offers M.W. advice on publishing his poems in small journals; he recommends Pynchon and rails against Beckett, and we laugh. We laugh, as Americans in 2015, because who could imagine a US intelligence agent caring about Beckett? Reading of M.W.’s undercover trips to literary parties in Berlin, one imagines an NSA agent in New York at a reading or book launch or panel discussion, and then arrives at an obvious conclusion: the literary scene is, most likely, not the primary focus in Fort Meade. Given recent revelations about the scale of AT&T’s cooperation with the NSA — 1.1 billion cell phone calling records a day, and billions of emails — it does seem possible that some of these conversations are about Pynchon or Beckett. But: would the NSA care? Would they listen? Anderson’s main task was to depoliticize the Prenzlauer Berg Scene . . . He committed the younger poets and painters in his circle to an aesthetic master plan and systematically marginalized and vilified the older, politically engaged or active authors. An experimental, ironic, “anti-political” writer, whose poems are essentially a product of the state — it makes for a chilling example. When Hilbig writes of a poet “reading a text that poured forth into the room a jumble of words and sentences, without paragraphs and . . . without punctuation,” we can guess whom he’s thinking about. This poet, called Reader, delivers “the same text over and over.” Hilbig depicts an underground literature that is dense, reference-heavy, obtuse, and ultimately fraudulent. Hilbig’s critique has added weight: he never collaborated with the Stasi. Also, Hilbig can write.
. . . at what point, I asked myself, would we have outstripped our ability to decisively categorize the things we clarified: as still belonging in the realm of simulation, or already as budding reality? The words ‘still’ and ‘already’ conveyed the crux of it: Could the simulation become reality, and where was the transition? Could what was still a simulation already have made the transition to reality before we had clarified it and brought it to light? Hilbig is clearly playing with postmodern theory, and perhaps parodying it, but the result — even in context — is frustratingly opaque. It’s best when Hilbig’s ideas naturally infuse his writing; when, for example, he compares the “trundle and screech of vehicles” at twilight to “the clamour of already sleepy children who feel it necessary, from sheer exhaustion, to make an especially vivid display of high spirits,” and then adds: “. . . what a strange simile.” We hear the traffic and see the children, and we also come to understand something about M.W. : his self-consciousness as a writer undercuts everything he says, even at his most lyrical moments. Hilbig has a gift for punctuating thorny prose with moments of stark clarity, as well as the ability to write about big ideas in a way that is simple and clear. Throughout ‘I’, one phrase runs through M.W.’s head again and again: “You see best from the dark into the light!” The words are from M.W.’s first Stasi boss, who meant them literally. He was talking about the lit windows of houses. We, of course, think of writing: the way one sees most clearly from a distance. You see best from the dark into the light. We think, too, of Wolfgang Hilbig. From his spot in the boiler room he saw from the dark into the light, and he saw the surveillance state around him as clearly as any writer of his generation. Over twenty years later, in a surveillance state all our own, what Hilbig saw in ‘I’ is still urgent. We could use more books like it.